Ford plans to make India an export hub for cars such as the EcoSport, shown. SANAND, Gujarat, India (Reuters) -- Ford Motor plans to triple exports from India with a new $1 billion plant, offsetting slower sales inside the country with a push to sell more local production abroad. 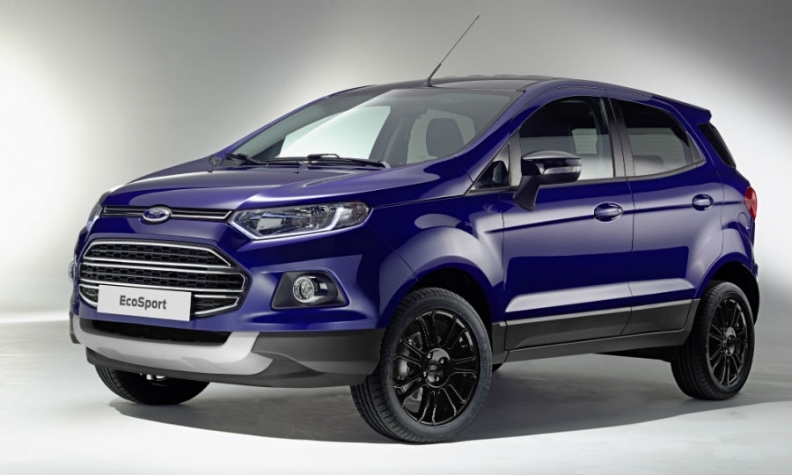 Ford will make India an export hub for cars such as the EcoSport, a subcompact SUV that it ships to Europe from India, and for its new Figo Aspire, which is based on the Fiesta sold in Europe. The new factory here will nearly double Ford's installed production capacity in India to 610,000 engines and 440,000 vehicles a year, Ford CEO Mark Fields said at the plant's launch today. The plant will have an initial installed annual capacity of 240,000 vehicles and 270,000 engines, Ford said in a statement. Ford currently builds the EcoSport at its plant in Chennai, southern India. Ford sold 77,140 vehicles in India in 2014 down from 80,431 in 2013, while exports nearly doubled to 76,981 units over the same period. In comparison, market leader Suzuki Maruti sold 81,564 passenger cars in December alone. But the market, already the world's sixth largest, is tipped to grow rapidly. While sales rose just over 2 percent last year, industry experts expect that to accelerate to 6 percent to 8 percent in the fiscal year beginning April 1. Ford expects Indian auto sales to more than double by 2020. India's government under Prime Minister Narendra Modi has sought to encourage manufacturing in a drive to boost jobs in a country where a million people join the workforce every month. Abdul Majeed, partner and auto expert at PriceWaterhouse India, said: "India is going to be attractive [as an export hub] because of the low cost base and also the expectation that when the dollar strengthens it will be favorable for exporters." But Ford's India production drive comes with heavy automation, as it tries to hedge against a steep rise in labor costs that has hampered firms elsewhere in Asia. Ford employs 2,500 people in the new Gujarat plant in western India, twice the number in its similar sized plant in Chennai. "Over time in these emerging markets labor costs will go up," said David Scoch, president of Ford's Asia Pacific operations. "We have seen that in China."